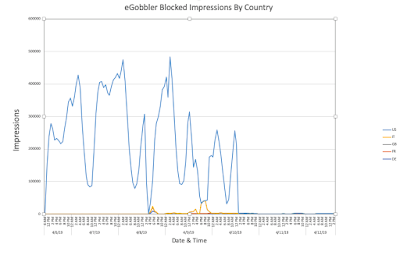 eGobbler, a threat group recently targeted iOS users from the U.S. alongside various European Union Countries through numerous massive malvertising attacks for almost a week and utilized Chrome for iOS vulnerability to sidestep the browser's built-in in pop blocker. The said threat group utilized "8 individual campaigns and more than 30 fake creatives" all through their push, with every one of the fake ad crusades having life spans of somewhere in the range of 24 and 48 hours. 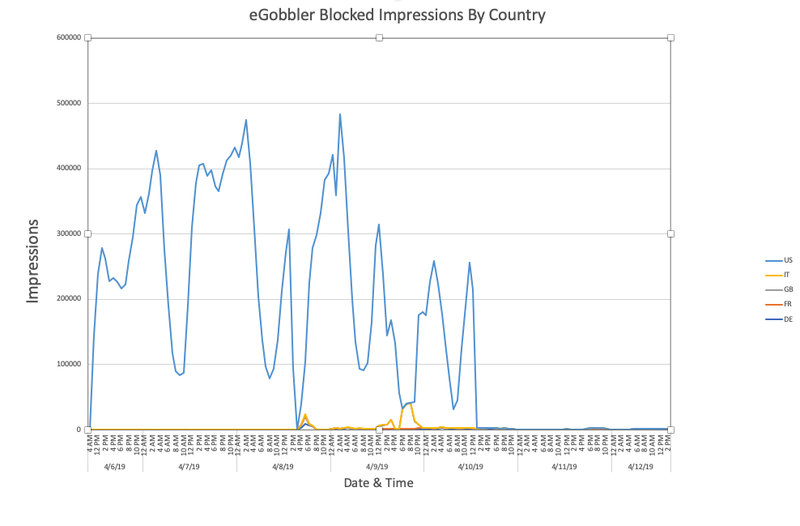 As per the Confiant researchers who found and observed eGobbler's iOS-targeted attacks, approximately 500 million users' sessions were somehow exposed to this extensive scale coordinated campaign pushing counterfeit promotions i.e. fake ads. As found by Confiant's specialists eGobbler's campaigns more often than not remain active for a maximum limit of 48 hours, quickly pursued by brief times of hibernation which unexpectedly end when the next attack begins. Some of them are even seen to have used landing pages facilitated on .world domains utilizing pop-ups to hi-jack users' sessions and divert the unfortunate casualties to vindictive pages, as this technique helps the attackers in phishing as well as in malware dropping purposes. Anyway this campaign was not the first of its kind designed by the eGobbler malvertising group to explicitly target iOS users, as in November 2018, Confiant observed one more campaign kept running by the ScamClub group which figured out how to capture approximately 300 million iOS user sessions and diverted them all adult content and gift voucher tricks. Be that as it may, as Confiant said in their report, "This really was a standout campaign compared to the others that we track based not only on the unique payload, but the volumes as well?" They later included that “With almost half a billion user sessions impacted, this is among the top three massive malvertising campaigns that we have seen in the last 18 months."